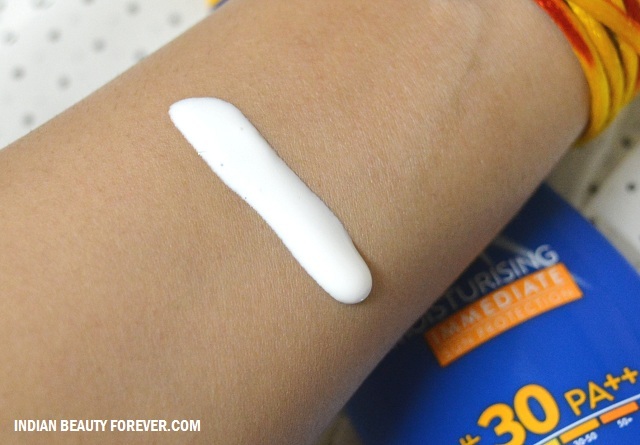 I will review Nivea Moisturizing Immediate Sun Protection, a sunscreen with SPF 30 +. Sunscreens are extremely important during summers when the sun rays are more direct and can be quite damaging. The one thing that I need from a sunscreen is that they should not be greasy besides the basic sun protection purpose for which they are being used. 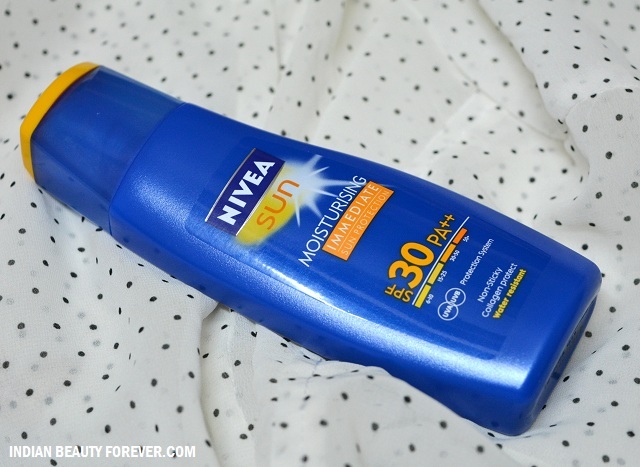 So, does this Nivea Moisturizing Immediate Sunscreen is the ideal non greasy sun protection lotion, or is it the one that will make you oil slicked when you sweat? Let’s check out. 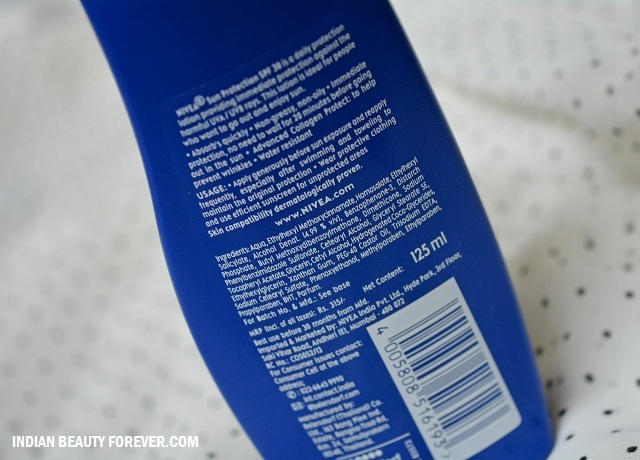 Price: Nivea Moisturizing Immediate Sunscreen is for 315 rupees for this 125 ml bottle. 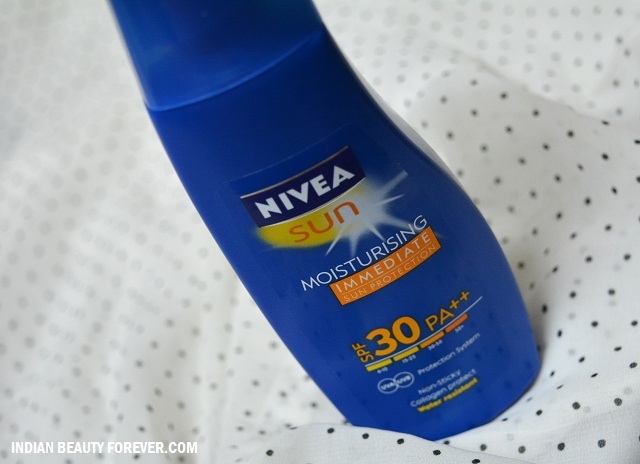 Experience with Nivea Moisturizing Immediate Sun Protection. The sunscreen comes in a trademark colored blued bottle with an orange cap. I like across all the brands, the sunscreens or related products are packaged in shades of orange color. The bottle is small can be carried in a bag and packaging is good. The cap is tight enough to prevent any accidental leakage. I don’t have dry body skin hence, I can skip the body lotion when I go out ad just apply the sunscreen only since most of them are greasy enough to act as a moituriser for skin as well apart from the sunscreen protection. This sunscreen is not very oily and has a nice formula which I liked since once it is absorbed into the skin, there will be subtle shine on the skin but that greasy, sticky feeling isn’t there at all. Even after sweating, the sunscreen will not make the skin oily. This is why, I liked the formula of this sunscreen. It will work well for the dry skin too. It has SPF 30 and should be applied 20 minutes before you go out in the sun. It also says that this is waterproof which I think it is, it is sweat proof and will not go away when you sweat. One more thing, you may have noticed that when you apply thick lotions like sunscreens, then the skin color looks a bit darker with the heaviness of the lotion like products. But after using this sunscreen I have not seen that. When I used it, my skin looks nourished and slightly dewy not oily at all. Take: This is a good sunscreen for all skin types. It is moisturizing yet not oily or greasy to make you sweat extremely. It is waterproof and sweat proof to up to certain extend. Good for daily use. This sounds so great! I actually do have dry skin so this will come in handy. Thank you so much for posting about it. I would try something like this out for for my exposed areas ! Seems good in summers. Will try it next!